Artmusedog and her new friend Opie ~ who went 'nutty' over her at first and was all over her. 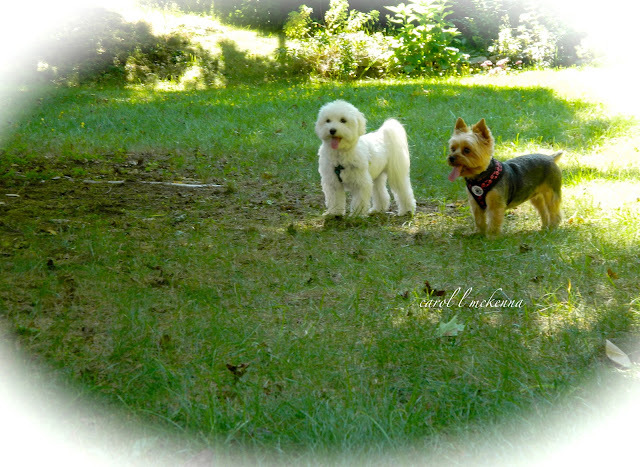 Both of them are 'fixed' so not sure what all the 'hoopla' was about ~ Here they are enjoying the day. Doesn't this look a bit like 'Doggie Paradise'? The two top ones are not likely to be ready until Sunday. The bottom two are ready now. So enjoy the photographers and sketchers today and tomorrow. Wishing you a wonderful weekend. I hope you show us when the blessing bowl book is all together. Awwww, they look so cute! Doggie paradise looks like lots of fun with cute little doggies. It will be interesting to see how you put your bowls into the sketchbook. I have heard that those pages are very thin. oh, your sweet furry ones playing together is just so sweet! Opie looks cute and your sketches are terrific! Beautiful picture of the dogs :) love the sketches. omg, what cute pups! doggie paradise looks like a lot of fun! thanks so much for this delightful post. Everything looks great, and your little doggie is a gem! That's great that they "played well" together. My dogs are not very sociable with others unfortunately. Beautiful sketches and adorable pups! your postcard from paradise is pure simple joy! your sketchbook project growing with beauty and love. today i have announced that postcards from paradise will once again dedicate each sunday in october to The Art of Remembering. thank you for your profoundly touching contributions last year. i hope you will invite your blog readers to join in. the power of simply sharing the stories of our loved ones now passed reaffirms our intention to live life fully and floods all our hearts with love. It does look like doggie paradise - all that lush green grass to play in. lovely pages with your blessing bowl theme, and those do look like happy doggies! Your sketchbook project is bound to be a blessing for all those whose eyes fall upon the bowls! Your sketchbook is coming together so beautifully. You've picked a great theme! what a cute photo of the dogs! Adorable! I like the cover and the haiku, most creative! Artmuse dog and her friend are super cute! Your sketchbook looks like it's going to be be great! Your dogs are just so adorable! I love that sketchbook. Adorable doggies and lovely work! Glad to pop by and check out what you've been up to! Missed the hops! Happy Monday!